It was quite a weekend! It was super nice on Friday, and then Saturday it was just one huge wind storm.. I didn't have to exercise, since picking up the trash taht blew into the yard was quite enough! Of course, I snuck in some time putting together a few 'vintage' cards... or tried to... this did get interrupted a few times for other odd and ends, but isn't the way it goes.. next I am going to work on a sign that says "CREATIVITY IN PROCESS, DO NOT DISTURB"... I am sure the teens will love it! This is my version of vintage...girly style! ﻿I used Crumb Cake cardstock as my base, and used it to sponge the edges. As a final touch I smooched it with Vanilla, but you cannot see that here. I paired it up with Blushing Bride. The sating ribbon is Pretty in Pink. This card is so pretty. Is that a punch or die cut flower? Did you put vanilla over the image to make it look vintage? Thanks for sharing it. Awesome job on your card the colors coordinate so well, love how you scrunched the ribbon over the decorative punched edge. I don't think it's too girly by the way I think it's Vintage ELEGANT!! 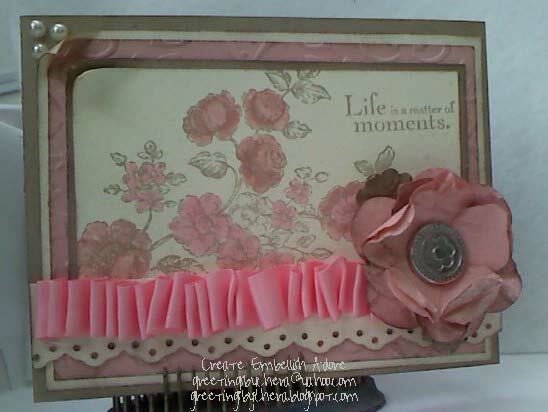 Just wondering what you used for the flower, punch die-cut? Stunning card! Is the image overlaid with vellum? Thanks for sharing.